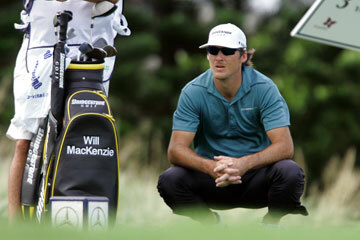 Mercedes-Benz Championship co-leader Will MacKenzie has spent as much of his time on Maui surfing as he has golfing. KAPALUA, Maui » You have to forgive Will MacKenzie if being atop the leaderboard after the first round of the Mercedes-Benz Championship is not all that. The 32-year-old golfer from Greenville, N.C., is making his first tour of duty of the spacious Plantation Course, thanks to winning the Reno Tahoe Open last year. Surviving the PGA Tour's Q-school in 2004 and 2005 was difficult enough, but his route here to Maui isn't atypical. A top junior golfer in high school, MacKenzie gave up the game his sophomore season and decided to split for Montana as a 19-year-old country boy to find himself. Mackenzie spent more time living in his van in pursuit of snowboarding and kayaking in the Big Sky country that reminded him of his mountains back home in North Carolina, as much as anything else. "Just wanted to do something different," Mackenzie explained to a group of reporters earlier this week. "I was a little bummed out (as a 14-year-old) because all my summers were taken up by golf. "I'm going into ninth grade and that's all I did was play golf. That's what you were supposed to do, I guess, if you wanted to be a great player. I burned out sooner than later and I guess that was a blessing for me. If I had gone to college and done that, who knows. I might be right where I am now, but I might have burned out in college and not be here." Instead, five years later he took a left turn on I-40 in North Carolina and struck out for Taos, N.M. Once there, he headed north for Durango, Colo., where he checked out every snowboarding spot Colorado had to offer. "Then I went to Jackson Hole (Wyo.) and ran out of money," MacKenzie said. "I went to work at Taco Bell for two weeks to get a little cash and I journeyed 3 hours north of Jackson Hole and found Big Sky, Montana, and it was just like home. I was like, 'This is the spot.'" It was there that MacKenzie took up kayaking full-time. He worked as a security guard, earning $15 an hour. He didn't like to shower or shave, and wound up washing dishes at the Huntley Lodge because they gave him a free ski pass. "I started meeting people and people started liking me," MacKenzie said of his first full year in Montana around 1995. "I got a little job down the mountain at a place called Allgood's Bar and Grill, and started doing dishes on the side. They elevated me to the cook and then I strictly worked down there for the rest of my Big Sky career. It was awesome. I lived in my van for about a year there. "I mean, I had it made there. I was living, I had hot tubs, jacuzzis, pools, access to the Huntley Lodge sort of sneaking around a little bit maybe. This was a day for Will MacKenzie. Wake up at 7 because I'm too cold and I can't sleep anymore or either it's, you know, it's going to be a great day. Put on all my gear, my long underwear and my socks. Go get a little breakfast and stay in the sort of free skier parking lot. I'd try to be the first chair up. Go snowboarding pretty much all day. Then work all night. Pretty monotonous." But that's not where his journey ended. He eventually headed to Alaska to do some heli boarding and skiing. When asked if he ever came close to death doing this extreme sport, he pondered for a moment before saying, "Probably for the layman, yes, I've edged off cliffs and been like, 'Oh no.' About died there where I was going to die or had to hike out or something, come up on like a 50-foot gnarly cliff with rocks at the bottom that I had to jump off of, but realized I was going to die. "I've been upside down in my kayak thousands of times and I've hit my head pretty hard. Fortunately, I've never been knocked unconscious. One of my good friends died in an avalanche there and when I was kayaking, you know, you were always hearing about this guy dying, this guy dying, this guy dying. One or two a year. It was just really insane stuff." It would be another five years before MacKenzie took up golf again in 1999, inspired by Payne Stewart's U.S Open win that year in North Carolina. He turned pro in 2000 and needed another four or five years knocking around the back roads of professional golf before surviving qualifying school in 2004. He only made 12 cuts and finished 179th on the money list, so it was back to Q-school again. Last year, he finished No. 100 on the money list, thanks to a win at Reno, Nev. Since he's been here on Maui, MacKenzie has spent as much time surfing as golfing. He and Adam Scott went out one day, leaving Scott wondering why he had tagged along. "Will's a good surfer," Scott said. "He cracks me up. He charges. He's got no fear. There's a reef under there, and I just saw him the other day go face-first off the top of the wave and I'm like, 'Oh, Will.' And I was waiting for him to come up with a mouthful of teeth. He was fun. He's a fun guy making a racket out there, like, don't upset the locals. He's awesome." And he's not a bad golfer, either, as yesterday's 4-under 69 attests. Tied with four other golfers after the first round, including Vijay Singh, MacKenzie just takes it all in stride. "It was fantastic," said MacKenzie, who nabbed a local caddie who knows the course quite well. "I hit the ball really well out there for the most part. I putted well. I made the little eagle on nine and that always helps. There's pressure out here. Oh yeah." But for a guy who has come close to the edge many times before, it's not all that.